GERALDINE Casey was just a baby when on an April night in 1989 loyalist gunmen burst into the family home at Shamrock Park near Rasharkin and shot her father dead in front of her and her mother Una while the other children slept in the next room. 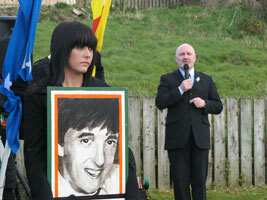 On Sunday 5 April Geraldine held a portrait of her father as she attended a 20th anniversary commemoration in honour of the North Antrim IRA Volunteer. Collusion has always been suspected in Gerard Casey’s murder. He was held in Castlereagh holding centre prior to his murder and had publicised the fact that the RUC had threatened his life. The RUC had raided his home and taken his legally held shotgun from him weeks before the murder. The same raiding party had also drawn detailed maps of the interior of his home. Then weeks later he was shot dead by a gang evidently familiar with the layout of his house. Speaking at Casey’s graveside last Sunday, Sinn Féin’s Alex Maskey recalled that 20 years previously he had given the oration at Gerard’s funeral. He praised the courage and dedication of Gerard the Volunteer and the resilience and tenacity of the North Antrim people. In particular he praised Gerard’s family for their courage and forbearance in the face of the suffering and pain they had suffered.